Automated Clearing House (ACH) payment volume is increasing every year. NACHA estimates that ACH payments crossed 21 billion several years ago. Financial institutions are re-evaluating their current payment platforms. Financial Transaction Manager is a single interface that can handle ACH needs that cross various platforms. 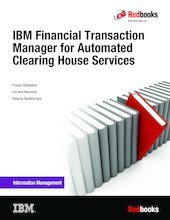 IBM® Financial Transaction Manager for ACH Services provides pre-built support for processing all ACH transactions that flow through financial systems. This includes ingestion, validation, transaction management, and distribution. The robust rules-based environment handles payment routing and exception management, and an automated import and export facility handles ACH processing rules. Further functions include administration, process management, data warehousing, and reporting and extracts. This IBM Redbooks® publication is written for the business analyst (banker), and the computer administrators responsible for configuration of the system. A business analyst can use this book to see what process within Financial Transaction Manger are associated with their banking terms. A bridge is built from banking terms to configuration terms. A system administrator can look into this publication to see exactly how to configure Financial Transaction Manager for ACH to the needs of their financial institution. By creating reference points for both the business analyst and the system administrator, communication and understanding is enhanced as both teams understand each other's terminology and how to use Financial Transaction Manager for ACH.